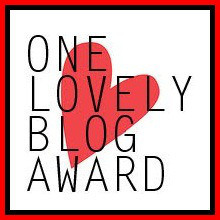 a Little while ago, the sweet Makeup_A_Storm sisters ( makeupastorm.wordpress.com ) nominated me for the One lovely blog award. Thank you for the nomination ladies! 1. Thank the amazing person who nominated you and post a link to their blog, not forgetting to follow them. 2. List the rules and display the award . 4. Nominate 15 other amazing blogs and comment on their posts, letting them kniw that they have been nominated. I don't have 15 people to nominate, since most of my favorite bloggers have already been nominated, But here are "the chosen ones" haha! Fact # 1 : I was 17 years old when I became a mom, If I had the option of going back into the past, I would do it all over again. She is my angel. Fact # 2 : I'm a girly-girl, but you will rarely see me in pink. When it comes to clothing, I am obsessed with anything black. Fact # 5 : I say THE "f" word more often than I should. Fact # 6 : When I bake bread I can't help but eat some of the raw dough, before you tell me I'm gross, my fiance does the exact same thing.We were meant to be. haha! Fact # 7 : Organizing my makeup and cleaning my brushes makes me happy.